What is the result of combining unlimited computing power, a zealous desire to manipulate all but the elite humans, and a morally crippled mathematical genius? Unfettered anarchy! Can the ever-growing torrent of information, analyzed by sophisticated computer systems, neutralize freedoms of choice, then steer us into a predetermined destination? Unidentified power mongers are plotting massive destabilization of the stock market, with the end game to not only optimize their wealth, but to also control the future. No need to cut a nervous investor off in traffic to initiate a stock market crash. All you need is unlimited computer power and the ethical nihilism to manipulate lives. The R-Group, a high-level information gathering and security team, believes at least one group - possibly several - are using Big Data analysis to customize the future to their image. Jacob, Petra, EZ, Quip, and the rest of the R-Group battle along with Julie and Juan's fledgling group of Cyber Assassin Technology Services teams to locate the source of the massive computing power required. Could these cyber schemers be as good at analyzing the information as the R-Group themselves? Award-winning authors Breakfield and Burkey bring the fifth book in The Enigma Series, The Enigma Stolen, into the relevant world of Big Data and analytics. Can all the information available provide a reliable method of predicting the future? Who are the winners when humans are herded to a machine's targeted end point? Wow this series gets better and better with every book I feel. Stakes are high in this one. More people are using the technology to hire assassin's to go after high profile people. When old foes and new friends come together to stop the computers from taking over you stay on edge. The R group is great as always. We get more character background in this one. A little bit of everyone's. Although not as much as I would like. But still we understand some of the characters. When politics and technology come together it's scary. It's almost as if the authors knew something we didn't back then. Can we stop technology from thinking and taking over for themselves? I think we really see how hackers are truly taking over little things. Not just them but as people are so use to our computers and phones we forget to really take in everything. This series proves that. Otto and the rest of the tight-knit group of techno experts are faced with several random events that when closely examined are all interconnected and deadly. Julie and Juan set up an on-the-ground organization to complete covert clean-up, surveillance, and collections for the R-Group. They soon discover a mole that must be dealt with accordingly. The cyber-attacks and clandestine work are riveting. The R-Group is faced with an immorally evil genius mathematician with the ability to create and manipulate data to predict the future. If that is not evil enough, she has ties to the Nazis through the secret Werewolf Clan! Burkey and Breakfield have taken a unique cast of characters and grown them into ones we, as listeners, care about. We see into their everyday lives, into the nitty gritty as well as the exciting work they do. True storytellers who weave realistic characters into the captivating story plot. One can only laugh at the sparing between Quip and ICABOD (the Immersive Collaborative Associate Binary Override Deterministic system is hilarious! As ICABOD learns humor and connects with other supercomputers, he forms an alliance complete with a Wednesday night poker game! 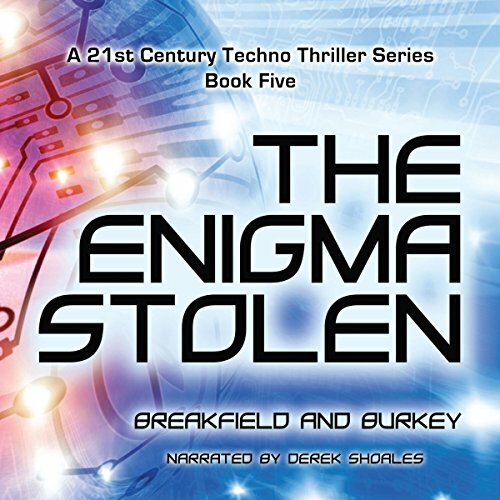 This is not a complicated techno-thriller audiobook – the authors, Burkey and Breakfield, keep it clear and understandable while also exciting. The plot is nail-biting, edge of your seat. We are given new characters and some returning characters. At the end, there is a major character twist that will leave the listener in shock. At least I didn’t see it ever coming! Derek Shoales, the narrator, performs the book perfectly! While his female voices are not female, they are distinct enough to know who is speaking. His voice has a calm, soothing tone. He projects the characters feelings – whether shock, amusement or pain – very well. I enjoy listening to him.